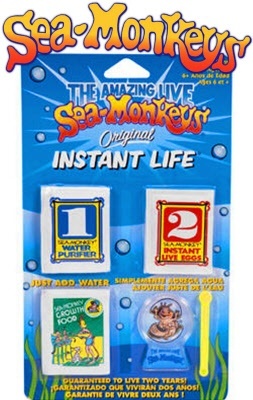 This Sea Monkey kit is the original starter set. If comes with all of the standard supplies but does not come with aquarium fish tank. Everything you need to start up and grow sea monkeys except the aquarium. So if you already have an aquarium and just need to fill it, then this is the kit for you. Three step process with instructions. This kit is guaranteed for 2 years by the Big Time Toys and Schylling Toys. Requires a 10 ounce container or larger (not included). For over 45 years the Instant life Nyoys Artemia have been sold.